Pinkadots Elementary : Are your little LEPRECHAUNS' desks clean? 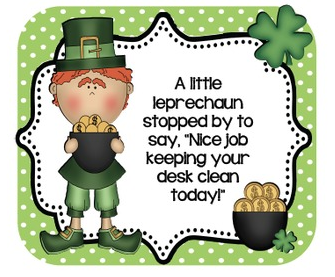 Are your little LEPRECHAUNS' desks clean? Oh Lucky you! You hopped on over to my blog on a great day. I'm so excited to be joining this blog hop because this year for St. Patrick's Day my partners and I have some tricks up our sleeves. I am not one to normally celebrate this holiday because I am 0% Irish, but my husband loves St. Patty's Day and that makes my two kids a whole 4% Irish! hahaha. So we plan on enjoying some green eggs and ham on Tuesday morning and dressing in green for school. I was so excited, I even bought my two little leprechauns matching t-shirts. They already wore them earlier in the month for green day, but they are perfect for Tuesday too! I am excited to be sharing with you some adorable little clean desk reward cards that I will be using Tuesday morning. During bus dismissal, I always tell my students to check the inside of their desk to make sure it is neat and organized. Only about 8/24 listen to this. The rest enjoy living on the edge. Tuesday morning the people that listened will find this note in their desk with a special treat. Have you been to the Dollar Tree lately? They are in St. Patrick's Day overload and have everything I could possibly need to bribe excite my students for the week. I grabbed some good luck pencils, clover themed sun glasses, and chocolate gold coins. I was also excited to see that Big Y now has a peanut/tree nut free bakery section and has adorable clover themed cookies. I plan on grabbing a few containers of those to make the day special as well. My class received an at home project last week for creating a leprechaun trap. I told them it would count for science and writing extra credit. The talented Jivey, came up with the idea and so many of my students JUMPED at the chance to show their creativity. Check back later this week, so I can show you the fun pictures of how the day actually turned out! Ready to grab another freebie? Check out Emily's blog, I Love My Classroom. Love this little freebie of yours. I think it wa last year I found it and they're already printed and ready for student's desks on Tues. Thanks so much! I always love rewarding my organized kids!! Thanks for such a cute freebie!! This is SO cute! Now, 24/24 of your students will listen, I'm sure! Thank you for these desk cards! They are adorable and will work perfectly all week! I think just having the chocolate coins would be perfect! But of course, these little dudes are adorable!